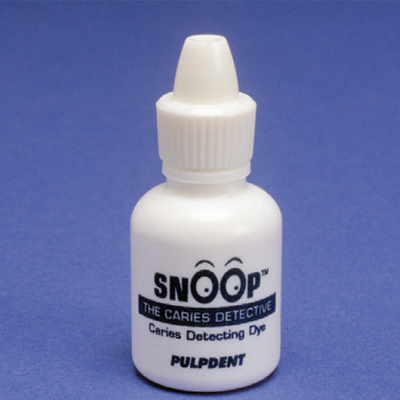 Pulpdent Corporation's SNOOP, a propylene glycol based caries detector, is used for identifying infected carious dentin. SNOOP's dark-blue color provides a strong contrast with both dentin and the pulp, and the propylene glycol formula has demonstrated to be more accurate than water-based formulas. Carious dentin is made up of 2 distinct layers: an outer layer of infected carious dentin and an inner layer of uninfected (affected) carious dentin. Only the outer infected layer is stained by a 10-second application of SNOOP and is then removed, while the inner uninfected layer can remineralize and remain unstained. SNOOP easily distinguishes between the 2 layers, can detect caries in difficult-to-see areas, and helps preserve tooth structure by enabling the dentist to perform a conservative cavity preparation, removing only the outer infected dentin.